As the LA market continues to heat up across all sectors and with a fear of looming interest rate hikes, financing major developments has become a hot topic. For hotels, one of the hotter strategies is EB-5 funding. 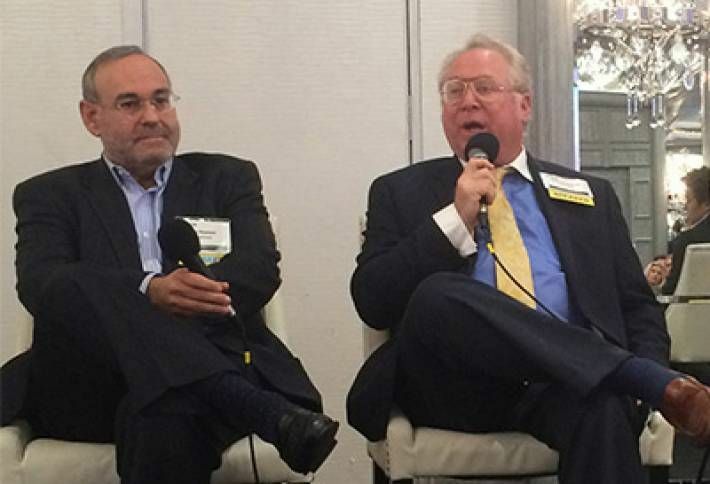 San Francisco-based developer Sonnenblick’s principal, Bob Sonnenblick (pictured here with Athens Group COO Jay Newman), launched the discussion of hotel investment and development at Bisnow’s 3rd Annual LA Hospitality Boom event last week, discussing capitalization of an $80M hotel his company is developing on USC’s medical campus. In financing the project, his firm put up 25% equity and secured a loan for 50% of the cost at 5% interest. But instead of filling the 25% equity gap with mezzanine money at 12% to 14%, his firm leveraged EB-5 funds at “an unbelievable 6%” rate, he says. “EB-5 money is a game changer,” Bob says. He noted EB-5 doesn’t work for everyone, as securing funding is a one-year process. “We had time to wait, because it took that long to get the project entitled,” Bob says. The program may not be available much longer; Congress is scheduled to consider a bill to limit it.